AUO's president, Paul Peng, reiterated the company's plans to start AMOLED mass production in Q3 2012. AUO will make 4.3" panels featuring 257 ppi. Peng also reveals that the company is co-developing in-cell touch AMOLED panels together with some handset makers, and will have samples ready by H2 2013. 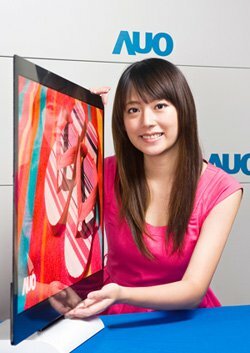 There are also reports that AUO plans to introduce large-size OLED panels by the end of 2012. The company is reportedly working in cooperation with Japan-based firms to develop those panels. The AMOLEDs will be produced in AUO's 6-Gen R&D line and be based on Oxide-TFT backplanes. AUO was supposed to start producing 4" to 5" AMOLED panels in Q2 2012, but the company still faces technical issues - mainly low yields (less than 20%).